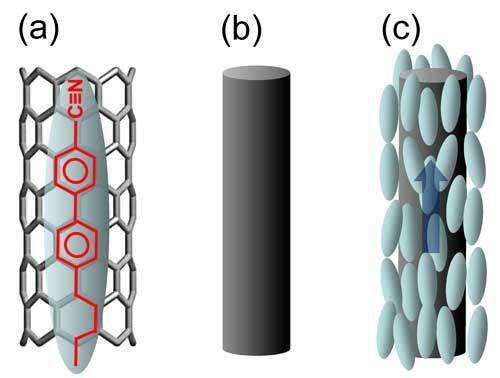 Carbon nanotubes (CNTs) being highly electrically conductive along the tube axis, have gained great research interests in recent years for connecting two conducting electrodes at the nanoscale – where the CNTs can be integrated into a micro- or nanoelectronic system. Due to the anisotropic nature of conductivity, CNTs have potential applications in nanoscale switches and nano-electromechanical systems (NEMS). Therefore, the orientational control of CNTs has drawn a great deal of research interest in nanotechnology. Assistant professor Rajratan Basu and his student Midshipman Alfred Garvey in the Department of Physics at the United States Naval Academy have developed a technique to bridge two electrical conductors by assembling CNTs guided by liquid crystals (LCs). They report their findings in Journal of Applied Physics ("Insulator-to-conductor transition in liquid crystal-carbon nanotube nanocomposites"). "CNTs don't have any permanent dipole moment, and therefore, they do not interact with a uniform electric field," Basu explains to Nanowerk. "When a small quantity (~10-3 wt%) of carbon nanotubes is doped in a LC, the LC molecules self-assemble themselves at the CNT surface due to π-π electron stacking, creating pseudonematic domains (PNDs) surrounding the CNTs." See Figure 1. Basu and Garvey show that an LC platform can be used to construct CNT wires that can electrically connect the two electrodes of a parallel plate capacitor-like cell. The PNDs surrounding the CNTs have dielectric anisotropy. Therefore, they experience a torque when an electric field is applied. Without the external field, the PNDs are randomly orientated in the isotropic phase as shown in Fig. 2(d). When the E field increases - i.e. the voltage is ramped up across the cell - the PNDs start to align along the field, and the CNTs being embedded in the PNDs, also follow the rotation. During this rotational process, multiple PND-encapsulated CNTs find each other and form a wire-like structure due to their natural tendency of entanglement. When the length of the CNT-wire is grown above the cell thickness, the two get electrically connected, as schematically shown in Fig. 2(e), and the contact resistance of the system drops to 187 Ω from 1 MΩ, exhibiting an insulator-to-conductor transition. See Fig. 2(a). "The scientific broad impact of these findings will be very strong in understanding the basic science behind the interactions of LCs with CNTs and the applications on nanoscale LC alignments at the nanoscale interface," concludes Basu. These findings will likely open up new research areas, such as their potential applications as LC-guided CNT-wiring in nanoelectronics. This research was supported by the Office of Naval Research (award # N0001416WX01530).